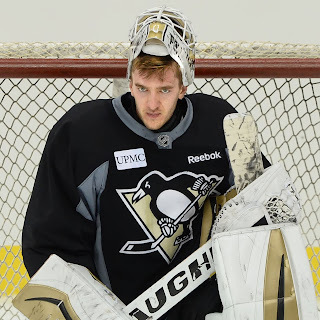 Word was released from the Penguins that hotshot goalie Matt Murray, their assumed future in net, was sent back to Wilkes-Barre/Scranton after a one game call up to, seemingly, replace the knocked around Jeff Zatkoff for more than just one game. We know now that his time in Pittsburgh was not for the long haul. And that's just fine. After Jeff Zatkoff's sudden spot start against Buffalo in Saturday, one that ended about as well as all expected, the rancor began to bring Murray up to the big club in perpetuity. It's an argument that makes a lot of sense. Zatkoff has been... well... can't say anything nice, say nothing at all, right? Murray is the heir apparent to the best Penguins goalie of all time (by numbers) in Marc-Andre Fleury. Murray has proven himself capable of winning. Why not bring him up? Looking ahead at March, it'd be a great time to have Murray (or anyone other than Zatkoff) in net. March is the definition of grueling for the Penguins. They'll play 16 games in 31 days. They'll play 12 of those 16 games against Metropolitan Division opponents. They need EVERY point they can get. It's hard to argue against having Murray when this team needs as much help as possible. And yet the team, at this moment, seems to disagree. It's holding true to their plan for Murray's development. They seem content to let him gather big minutes in the AHL, to be The Man for the Baby Pens, and see what he can do to guide WB/S in the playoffs for a deeper appreciation for his longevity and stamina. It may seem frustrating, but it's also fine. There should be an uprising to replace Jeff Zatkoff. Questionable lateral movement, tough at tracking pucks in crowds, he's a big body that seems to be small in net. If there's one position that needs an upgrade at the trade deadline it should be back up goaltender. However, letting Murray play out the season is the smart move. It's building team chemistry in WB/S for a championship run. It's giving him the minutes to improve his stamina. It's measuring his ability to be The Man. Calling up Murray is a fine short term stop gap for a big league club that wants, needs, the playoffs for a successful season. Their overly lengthy misstepping under has put them in a position to need all they can gather. It makes every loss stressful. It, with the playoffs around the corner, put a premium on your best playing as much as possible. 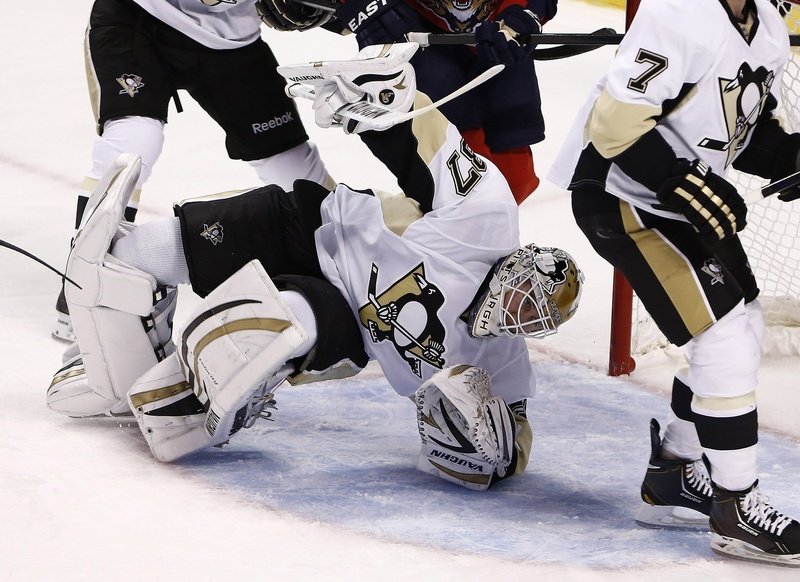 However, this is Fleury's prime. He has the longevity to run the table. He'll be taxed and tested in March. Zatkoff will be played sparingly. By all accounts, that's what Fleury likes. He wants the pressure. He wants that drive. Having Murray spell him wouldn't be bad, but what do you do after March? In April the Penguins play five games in nine days. Four of those five are against Metro opponents. You keep Murray and play him, it's fine. 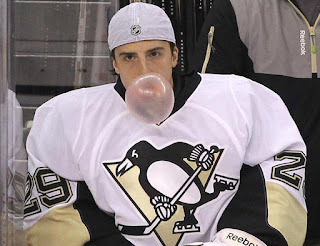 Come the playoffs, it's now Fleury's game. Jeff Zatkoff sitting on the bench is fine. Matt Murray's sitting on the bench is not what's in his best overall interest, nor the best interest of the Penguins long term health. There's a lot made of the Crosby/Malkin window. That's justifiable. However, the Shero era left us all wondering about long term replacements and poor drafting. One of his gems in Matt Murray. It's disingenuous to worry about Shero's poor drafting then on the other hand screw with the team's planned development of one of his top picks. At the deadline, it's a must to have a better back up. The sooner, the better. Murray is a good option but the team doesn't seem to think, at this time, it's the right move to stow him away behind Fleury. There are only two months left in this season. If you were going to hand Murray a set of spare keys to the car, the time was long ago. At this point they trust the team to ride with the horses that brung them. It can be frustrating, but that's okay. It'll be worth it in the long run. As Jim Rutherford told the press today, "We want him to play as many games as he can." Whether that's in Wilkes-Barre/Scranton or Pittsburgh remains to be seen. To keep the glimmer of having Murray on the club alive, as Rutherford tends to in his own flirty way, he followed up with, "We haven't made that decision yet. You'll see more of Matt Murray after the trade deadline." Right now, this isn't Murray's time. That's fine. They'll make the move when it's necessary. Until then let's pretend they know what's best, even though that can be difficult.